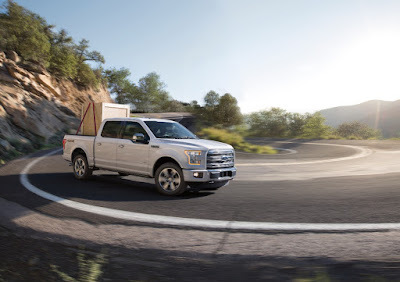 BRIGHTON, MI – There’s a new sport mode in the 2015 F-150. Ford engineers have combined the sport mode from the new Mustang into the lightweight F-150 for the ultimate driving experience. Since the Mustang and F-150 were developed around the same time they were also test-driven on the same trips. After the F-150 was driven engineers realized how well the reduced weight design accelerated, so engineers put their heads together and the sport mode was added. To activate the sport mode, drivers simply press the tow/haul button twice and an amber “S” will appear in the bottom-right of the tachometer. Sport mode works by lowering the frequency of gearshifts and keeping the truck in its “sweet spot” of the powerband. The transmission holds lower gears for a longer period of time to make driving more responsive and fun. When the F-150 is in sport mode the driver doesn’t have to push the pedal down as far to reach accelerate. Over the experience gives truck drivers much more control and gives the truck more liveliness. Another feature of the F-150's transmission is the capability to match engine rpm while downshifting in slowing to go around a corner. This technology came right from the Mustang as well. The new sport mode in the 2015 F-150 is standard now and you can activate it in any drive. You can see all of our 2015 Ford F-150 inventory online, or stop by and check 'em out in the flesh! Does your current truck need a little TLC? Well bring it by our Brighton Area Car Repair Center today to get your next tune-up! At Brighton Ford, we KNOW trucks, so trust us, we'll take great care of yours! Brighton Ford is located at 8240 Grand River Ave. just north of I-96 in Brighton. We are a family owned and operated business that strives for customer satisfaction. For more information on Brighton Ford visit BrightonFord.com or give us a call at (800) 836-8206.